Bring water to a boil over high heat in a pot. Once the water is boiling, add lentils and reduce heat to medium-low, letting it just barely simmer until lentils are tender, approx. 20 – 30 min. Strain and set aside to cool. While waiting for the water to come to a boil, mince all garlic, red onion, parsley, mint, and cilantro, setting the onion and herbs aside in a large bowl, and reserve garlic separately. Dice cucumber, seed and dice tomato, zest lemon, and add all to the bowl with herbs. Juice zested lemon and reserve. While lentils are simmering, heat olive oil in a skillet over medium heat. Add most of minced garlic (reserving about one quarter) and cook until golden, approx. 5 mins. Remove pan from heat and add in cumin and just over half of lemon juice. Mix to combine. Add warm lentils to the bowl with herbs and tomato and cucumber, then pour the garlic mixture over the top. Season with salt and pepper to taste and toss lightly. Mix yogurt with remaining garlic and lemon juice in a small bowl. Season with salt and pepper to taste. 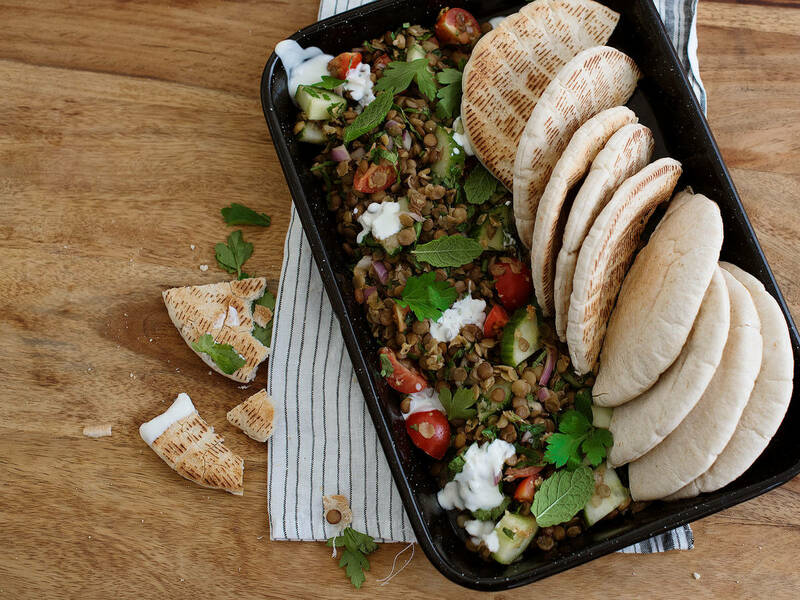 Serve lentils at room temperature with yogurt sauce on the side and serve with warm pita bread or other flatbread. Enjoy!